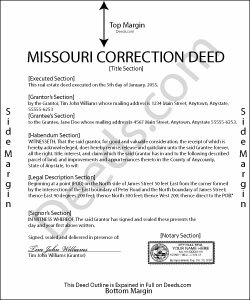 Use the correction deed to correct an error in a warranty, special warranty, conveyance, or quitclaim deed in Missouri. A corrective deed is in effect an explanation and correction of an error in a prior instrument. As such, it passes no title, but only reiterates and confirms the prior conveyance. It should be executed from the original grantor to the original grantee, and it needs to be recorded in order to be legally valid. The correction deed must reference the original conveyance it is correcting by type of error, date of execution and recording, and recording number and location. Beyond that, it restates the information given in the prior deed, thus serving as its de facto replacement. The prior deed, however, which constitutes the actual conveyance of title, remains on record. Deeds of correction are most appropriate for minor errors and omissions in the original deed, such as misspelled names, omission of marital status, or typos in the legal description. More substantial changes, such as adding a name to the title, changing the vesting information or the legal description of the property, require a new deed of conveyance instead of a confirmatory deed. Angie K. said: Thank You! Reply from Staff: Thank you Angie. Steven M. said: They always get me the information I need, in a timely manner. Jerri S. said: Very helpful. Print out go to court house spent less then 15 minutes there and done! Thanks will use again. Reply from Staff: Thank you Jerri, we appreciate your feedback. Maurice M. said: It was very convenient to be able to purchase the forms that I needed and save an extra trip downtown. I really appreciated the instructions that came with the forms. Reply from Staff: Thank you Maurice. Have a great day!